IN present time, many industries causing air and water pollution through smoke emission and dumping of untreated effluent. 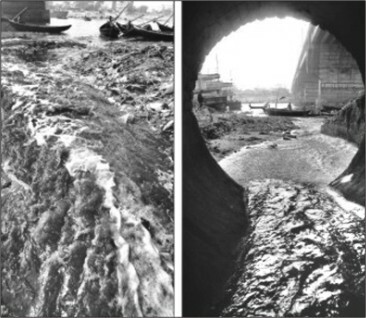 Industrial wastes have polluted the water of the Buriganga, the Shitalakhya, the Karnafuli and the Rupsha rivers and the land, air of the adjacent places. The foremost question is what seems to be the problem in failing to prevent industrial pollution, e.g. the rusty law or powerless body to enforce or corruption all over again? Since early sixties, of necessity, industries of various kinds started to spring up slowly in Bangladesh, the then East Pakistan. The Factories Act, 1965 was passed as a precautionary measure against possible industrial accidents than as a deterrent to any threat of pollution. Subsequently, Factories Rules 1979 and East Pakistan Water Pollution Control Ordinance, 1970 (Ordinance V of 1970) was disseminated to provide for the control, prevention and abatement of pollution of waters in the then East Pakistan. After liberation of Bangladesh, this Ordinance was rightly repealed and replaced by the Environment Pollution Control Ordinance, 1977 for providing, stricter protection. The Government found it necessary to upgrade the Environmental Pollution Control Ordinance 1977 recognizing the changed circumstances and the potential degradation of the environment. The Environmental Conservation Act 1995 (“ECA”) was passed by the Parliament in February 1995 and came into force in June 1995 repealing the Environmental Pollution Ordinance Act 1977. Subsequently, the Government in exercise of its rule making power conferred by Section 20 of the Act, promulgated the Environment Conservation Rules, 1997 (“ECR”). The Rules lay down the procedure for achieving the objectives provided for in the Act. The Department of Environment (“DOE”) headed by the Director General (DG) under the Ministry of Environment and Forest is the Regulatory Body responsible for enforcing the ECA and ECR. To prevent the industrial pollution the DG can give order, direction or issue notifications, to the owner of an Industry for improvement of the surrounding environment by controlling and mitigating any pollution caused by the activity of the industry. However, this body is useless, with no strict approach from the Governments.The present legislations are vague with no real strict approach or applications. (a)	The discharge standards of emissions, discharge and noise fixed in the ECR for industries are less stringent compared to the developed countries. The industry should know the period of constancy of the discharged standards stipulated in the ECR because the design and investment in the Effluent Treatment Plant will be based on the present values. Thereby, any change either will increase the operating cost of the ETP or may render it ineffective. (b)	There is no specific criterion of locating industrial plants in the ECA and ECR. However, a general guideline is provided. This guideline is very vague and it is not enough to keep the present industrialization in balance with the eco-system. (c)	. ECR does not have any specific and precise provision to provide guidelines and directions on an Environmental Impact Assessment (EIA). (d)	The ECA specified that a notice is to be given, in case of any investigation, to the Industry to enter but does not specify a minimum period of notice (Clause 11 sub section 3 of ECA). So far, Bangladesh Environment Lawyer Association (“BELA”) contributed quite a lot considering no substantial effort from any other organisations and lenient approach of all the Governments in the history of Bangladesh. (i)	BELA v. Government of Bangladesh and others (WP of 2003) (Tannery Case) (Original Petition)- This case brought the development in the legal sector one-step forward for preventing industrial pollution as it recognised and raised awareness about the issue of industrial pollution. (ii)	Mohiuddin Farooque v. Government of Bangladesh (WP 891 of 1994). This case is popularly known as industrial pollution case where the petitioner obtained some guidelines against industrial pollution to be effected by the government. However, there are more recent cases like Md. Zakir Hossain and others v. Bangladesh (2007), where 'industrial area' was defined in the context of Section 2(e) of Ordinance 1977, thus it excluded the municipal area from the definition of industrial area. Part III of the Constitution of Bangladesh enshrines the basic right of the people under the heading “Fundamental Rights'. This chapter contains Article 26 to Article 47A, Article 26 declares that the laws inconsistent with the fundamental right to life and personal liberty as per Article 32. However, if the lives of the inhabitants living around the concerned factories are in jeopardy, the application of Article 32 becomes inevitable because not only a right to life but also a meaningful life is an inalienable fundamental right of citizens of this country. In spite of the Constitutional commands and the provisions of the Act and the Rules, the hiatus remained as before between the letters of law and the implementation thereof in the field of environmental pollution due to unresponsive of the apathetic concerned officials. Nevertheless, very few cases can crawl through the corridor of High Court Division and Appellate Division of our Supreme Court. The major reason seems to be the DOE with no real backing from Governments' policymaking and failure to recognise this as offence of strict liability under the present legislations. Only, the Governments' strict approach towards preventing industrial pollution along and strict and reformed legislations along with people's awareness can keep our beloved motherland as pure as ever. The author is Barrister at Law, specialised in Industrial Laws.